Headache is in itself a huge area ranging from sudden-onset severe headache possibly due to an underlying possible fatal problem to daily headache where sufferers may have had a headache every day for many years without let-up or relief. Fortunately both are relatively rare with the average person having episodic occasional headache which with correct diagnosis and management should not interfere with a normal life. Most of us will experience occasional tension-type headache which may or not warrant medication management. Migraine is the next most common form of headache affecting 6-8% of males and 16-18% of females. This figure indicates that nearly one in five women suffer from migraine! Most of whom have never been diagnosed and perhaps 50% of those diagnosed in Ireland have never been offered correct and highly effective medication. Many without correct help will self-medicate with poor benefit and sometimes drastic results in terms of out-of-control headache. Headaches requiring urgent attention Most with this type of headache will be seen in the accident and emergency department of a local hospital. Warning signs would include headache in the presence of one or more of the following: fever, loss of consciousness, confusion, lack of coordination, past history of lung or breast cancer. In addition: headache with first onset after age of 50years, severe headache with sudden onset reaching peak intensity within a minute, sudden dramatic increase in headache frequency in somebody with an existing headache condition. Many with migraine are sceptical at their diagnosis as being a migraine sufferer on the basis that they know a friend with “real migraine” who invariably has very severe and debilitating headache with profound vomiting and the sceptic refuses to accept a diagnosis of migraine when the above condition is not met. The truth is migraine for some can be mostly a mild headache with occasional more pronounced episodes. In truth most migraine sufferers will experience a combination of less intense “tension-type” headache with occasional “different” or true migraine headache. Remembering that people with migraine will tend to suffer from tension-type headache, it is important to realise that these features need not be present with every headache. Most people with migraine will have a close relative with a history of headache (probably also migraine). Some migraine sufferers will experience an “aura” usually preceding their migraine. The most common aura is a visual disturbance with a shimmering aspect to their vision. Some may experience a mild sensation of numbness in the face or hand and arm. Others may have transient difficulty with speech, concentration. Aura usually lasts no more than twenty minutes. Migraine can first occur in children and tends to resolve after 50 years of age. Some with childhood migraine begin with stomach upset and possibly repeated vomiting before going on to develop actual headaches in their teens. Peak onset is from age 25-55years. With advances in medication most can expect to live a life with headaches that can be easily controlled with migraine specific medications called Triptans, the most common brand names being Imigran and Zomig. These have few if any side-effects but in Ireland are available only with a prescription. For some over the counter medications can be effective but if not achieving a benefit level of 80% improvement in 80% of their headaches with these they should consider a triptan with their Medical provider. Effective control of migraine is probably very important in preventing the development of chronic migraine (defined by IHS as headache occurring on more that 15 days per month). In part poor control with inadequate medication can also lead to the overuse of medications and increased likelihood of developing chronic headache. Use of any medication to treat a headache on more than 2 or 3 days per week greatly increases the risk of developing difficult to control chronic headache. In a situation where headache is occurring more than three days per week or where headache severity is making normal life very difficult although less frequent consideration may be given to the use of a preventive medication which is taken every day for a period to reduce the impact of headache, hopefully reaching a point after an average of six months where the preventive medication is no longer required. Migraine in women probably 50% of women with migraine will find an increased likelihood of headache at the time of their often period lasting between 3 and 5 days. A small proportion of women will note this is the only time they get headache. Most women will experience an improvement in migraine during pregnancy and a gradual decline in migraine after menopause. Tension-Type Headache (TTH) is a poorly understood headache and is so called due to its originally believed relationship to muscle tightness in the jaw and neck muscles as opposed to nervous tension, stress or anxiety although these conditions may aggravate TTH. Most migraine sufferers will also experience TTH hence their reluctance to accept a diagnosis of migraine. The essential differences are that TTH is always felt throughout the head unlike migraine which in some is one-sided. The pain is described as a tightness around the head (often likened to wearing a tight hat) as opposed to the throbbing headache of migraine. The pain is mild to moderate in intensity and never associated with pronounced nausea or vomiting, although some may describe a loss of appetite. Given its low intensity and provided it occurs infrequently many will manage without resorting to medication. Specific migraine medications are not effective in pure TTH and in contrast to migraine most will find simple painkillers are effective. As with migraine use of medications should be controlled and used no more than two or three days per week to prevent the development of chronic medication overuse headache. Where occasional TTH is easily managed by the patient and will usually not require medical assistance Chronic Tension-Type Headache (CTTH) which by definition occurs more than 15 days in the average month can be very debilitating because of its frequency. Treatment of CTTH starts with discontinuation of all medication used to control the headache. Physiotherapy and acupuncture on the neck area can be useful where there are signs of problems in this area. As with migraine the presence of jaw related problems can be a major factor and requires treatment. Where all else fails an older type of anti-depressant type medication taken in low doses for several months can be helpful. 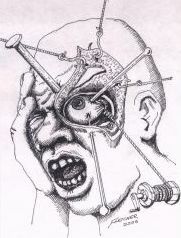 Cluster Headache (CH) is probably over diagnosed with those with severe migraine often been suggested as suffering from CH. In reality it is uncommon occurring in 0.2% of the population and in contrast to migraine much more common in men than women. Its most defining feature is a very extreme level of pain. The pain is always on one side of the head most commonly in the area of the eye or immediate surrounds. It is occasionally found to occur in the jaw, usually upper, and may be treated mistakenly as a toothache. Pain episodes last from45-90 mins but may be shorter or lasting up to 3 hours. They occur in clusters lasting commonly for weeks before completely disappearing for a time although some develop chronic CH which does not resolve although there will in all cases be pain-free periods in any given day. In some it occurs exclusively in sleep usually around 3 hours after going to sleep. In some alcohol is a strong trigger and is avoided for that reason. It is likely a distant relative of migraine and nausea may occur with CH. Unlike migraine where the sufferer may remain very quiet and if possible sleep through an attack, those with cluster Ha will usually be very restless during the pain and pace around often banging the head of a wall in an effort to relieve the pain! Typical features of CH include pronounced redness in the eye on the side of the headache, tearing from the eye, swelling and partial closure of the eyelid, nasal congestion or runny nose on the affected side. All of which rapidly returns to normal after the pain stops. Migraine specific medications in injectable form are very effective at controlling episodes of CH with preventive medications then used to stop the headache in the longer term. Paroxysmal Headache (PH) a very unusual condition is a very similar pain to cluster headache with highly intense pain around one eye beginning and ending very suddenly, but relatively short in duration lasting 2-30mins although often there is a low level of pain between attacks that can occur 1-40 times per day usually at any time. Many have migraine type symptoms such as nausea and vomiting with sensitivity to light during the attacks. Other features are the same as in cluster headache and may include pronounced redness in the eye on the side of the headache, tearing from the eye, swelling and partial closure of the eyelid, nasal congestion or runny nose on the affected side. All of which rapidly returns to normal after the pain stops. As with cluster headache there are usually pain-free periods lasting weeks to months with no episodes of pain. Pain does not respond to migraine medications and will only respond to high doses of an old type of anti-inflammatory medication called indomethacin. Sunct or Short-lasting Unilateral Neuralgiform headache with Conjunctival injection and Tearing is again a very rare one-sided headache again occurring around the eye area with severe but brief episodes of pain. Pain attacks are from 5 seconds to 2 minutes in duration occurring as little as once per day or more commonly very frequently possibly more than 60 times per hour. Pain may be triggered by touching the face or scalp, washing the face, shaving or jaw movement. Pronounced redness in the eye on the side of the headache and tearing from the eye are once more a feature. Unlike the other headache conditions there may be no periods of relief. Pain control is extremely difficult.